Nobuhiko Okamoto, Rina Satô, Haruka Tomatsu et al. After many long years perfecting the art of fighting, 17-year-old Yoichi Karasuma is sent down from the remote mountains where he has been raised thinking that he's going to study some new martial arts techniques. But what he's really going to learn about are some slightly more practical things, like electrical appliances, modern clothing and, most especially, how NOT to make girls want to kill you! Unfortunately, that last lesson is one Yoichi may not survive, as his new dojo is infested with the infernal creatures in the form of the Ikaruga sisters, and they don't really seem to understand how "proper" girls are "supposed" to behave! Will Yoichi's bushido blade be struck down by the fearsome charms of Ibuki, Ayame, Chihaya and Kagome? Or will the equally lethal girls from the rival Tsubame school be his undoing? 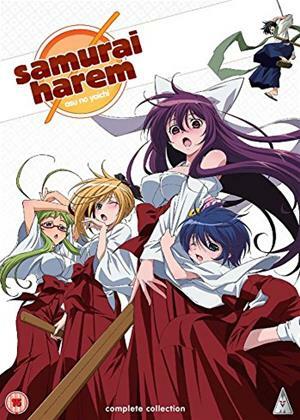 Whatever happens, there's bound to be hilarity ahead as someone's sword gets bent out of shape in the outrageous complete collection of SAMURAI HAREM ! The episodes are: 'A Samurai Comes! ', 'Welcome to Yokko', 'Amazing Without Clothes', 'Chihaya Being Chihaya', 'Let's Go On a Date! ', 'Wassan Comes! ', 'School Swimsuit, White School Swimsuit, Two-Piece Swimsuit', 'Back Then, You Were Badass', 'A Summer Festival - Plunging Into the Fire', 'A Battle to the Death at a Hidden Hot Spring! ', 'I'm Taking Ibuki' and 'Yoichi Fights On! '.